Iran's ambitious, highly secretive effort to build nuclear weapons included extensive research in making uranium metal. New details from a trove of Iranian nuclear documents stolen by Israeli spies early this year show that Tehran obtained explicit weapons-design information from a foreign source and was on the cusp of mastering key bomb making technologies when the research was ordered halted 15 years ago. Iran's ambitious, highly secretive effort to build nuclear weapons included extensive research in making uranium metal as well as advanced testing of equipment used to generate neutrons to start a nuclear chain reaction, the documents show. While Iranian officials halted much of the work in 2003, internal memos show senior scientists making extensive plans to continue several projects in secret, hidden within existing military research programs. "The work would be divided in two: covert (secret structure and goals) and overt," an Iranian scientist writes in one memo, part of a 100,000-document archive seized in a daring raid on a storage facility in Tehran by Israel's Mossad intelligence agency in January. The stolen documents contain no revelations about recent nuclear activity and no proof that Iran has violated the 2015 nuclear accord it reached with the United States and five other global powers. U.S. officials had long known of Iran's pre-2004 nuclear weapons research, which the Obama administration cited explicitly in prodding Iran to accept the historic deal limiting its ability to make enriched uranium and placing its nuclear facilities under intensive international oversight. Israeli Prime Minister Benjamin Netanyahu has seized on the documents in recent weeks to launch new attacks against the nuclear deal, which Israeli officials say is inadequate for containing Iran's long-term nuclear ambitions. The accord has been on life support since the Trump administration unilaterally withdrew from the pact in May. Iran says it is honoring the terms of the agreement and has no intention of building nuclear weapons. A large team of Israeli experts has continued to mine the document trove for new revelations while simultaneously sharing the material with U.S. and European intelligence agencies as well as with the International Atomic Energy Agency, or IAEA, the UN watchdog in charge of monitoring Iran's nuclear activity. Officials shared recent discoveries with a small group of Western news outlets last week, arguing that the newly uncovered evidence of Tehran's advanced nuclear weapons research - along with its elaborate efforts to conceal the activity while preserving the technical know-how for possible future use - shows that Iran cannot be trusted. Iran has disputed the authenticity of the documents obtained by Israel, calling them forgeries. Officials at Iran's UN mission in New York did not reply to a request for comment. "This archive explains why we have doubts," a senior Israeli official told US journalists at the briefing in Tel Aviv. The official, like others involved, insisted on anonymity in discussing highly sensitive documents and intelligence operations. "It explains why the (nuclear deal) to us is worse than nothing, because it leaves key parts of the nuclear program unaddressed," the official said. "It doesn't block Iran's path to the bomb. It paves Iran's path to the bomb." Many US-based weapons experts and former U.S. officials say Israeli critics of the agreement are missing the point. They say the new revelations show precisely why the nuclear deal was necessary. "We were at the (negotiating) table precisely because we knew that Iran harbored ambitions to build a nuclear bomb, and we wanted a verifiable agreement to block those ambitions," said Jake Sullivan, a former State Department official involved in early discussions with Iran over what would later become the Joint Comprehensive Plan of Action, or JCPOA, as the nuclear deal is commonly known. "In my view, the recent revelations do the opposite of undermine the deal - they reinforce the need for it." 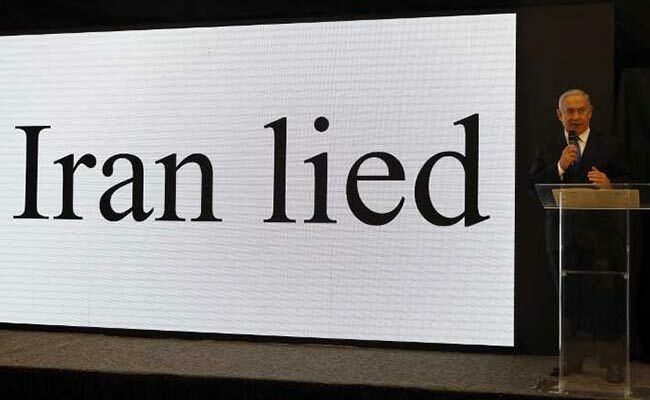 The stolen documents shown to journalists are part of the same batch that Netanyahu heralded on April 30 in a dramatic televised presentation to make the case that "Iran lied," as the prime minister repeatedly proclaimed that night. How they were obtained from a hidden storage facility in the middle of Tehran is only beginning to come to light. Israeli intelligence officials said they learned in early 2017 that Iran had begun systematically gathering records on the country's past nuclear weapons research and relocating them to a single repository in southern Tehran's Shorabad district. The building, in a row of industrial warehouses, had no visible security presence or other features that might have tipped off an observer that it contained something unusual. Only a small number of Iranians apparently even knew of its existence, said an Israeli intelligence officer briefed on the details. "We wanted to know: What are they hiding, and what for?" the officer said. "Once we learned where the records were going, we prepared an operations team to acquire them." Mossad agents were able learn the internal layout of the building, including the location and general contents of 32 safes that contained paper records, photos and computer-storage files from "Project Amad," the code name for Iran's nuclear project. The spies studied the building's security features and tracked the movements and schedules of the workers who maintained the archive. Eventually they settled on a date - Jan. 31 - and a time window of exactly six hours, 29 minutes, in which they believed they could breach the facility, open the safes and remove half a ton of documents without being detected. Because some of the material was too bulky to carry, the operatives opened only the safes that they thought contained the most valuable material, and then took away only the most important files. The techniques in the procedure were vaguely described as unusual, and in the vein of "Ocean's Eleven," the Hollywood film about a heist at a Las Vegas casino. How the vast trove of paper binders and computer disks was spirited out of the country is not publicly known. To counter Iranian claims that the documents are forgeries, Israeli officials allowed journalists to see and touch - with gloves - a few pages of original files, including handwritten notes signed by Mohsen Fakhrizadeh, the Iranian physicist who Western intelligence agencies say was in charge of Project Amad. Journalists were given copies of some documents, including several that were previously unpublished. Others were shown only briefly or not at all, on the grounds that they contained explicit technical details that could be used to make nuclear weapons. Among the records the Israelis said they were not able to share were documents containing design information for a nuclear bomb. Israeli officials said the documents were provided to the Iranians by a foreign source, but they would not specify whether the original provider was a government or a foreign national operating independently. Iran is known to have acquired information on building centrifuges for uranium enrichment from Pakistani scientist Abdul Qadeer Khan, an admitted peddler of sensitive nuclear information, in the late 1980s. U.S. intelligence officials believe that Khan passed partial blueprints for a Chinese nuclear device to at least one of his international customers. The IAEA also assessed that Iran obtained weapons design information, but proof was elusive, and Iranian officials denied the claim. Israeli officials declined to say whether the weapons blueprints obtained by the Iranians could have produced a functioning nuclear bomb. "We see explicit material related to nuclear weapons from different sources, some of it not Iranian in origin," one Israeli intelligence official said. Taken as a whole, the newly released documents reinforce a story line that has been publicly known for more than a decade: Iran created a covert program beginning in the late 1980s to build nuclear weapons but then halted the effort in 2003, following the U.S. invasion of neighboring Iraq and revelations about a secret uranium enrichment plant Iran was building near the town of Natanz. The broad outlines of Iran's research were known to IAEA inspectors.What is new is the detail, some of it startling, about the sophistication of Iran's nuclear efforts, and how far Iran's scientists advanced before the project was put on ice. Among the records are previously unknown photos of a large cylindrical test chamber in which Iran is said to have conducted tests of an implosion device of the type used to trigger a nuclear detonation. Other newly released documents show Iranians measuring radiation from a neutron-generating explosive test inside the same chamber in 2002. In modern nuclear weapons design, a neutron generator releases radioactive particles to help sustain a powerful nuclear chain reaction. Other papers and photos shed light on Iranian experiments in making a form of uranium metal that can be used as a neutron initiator, and still others describe problems with uranium contamination outside the test chamber, which was located at the Parchin military base outside Tehran. Years later, when U.N. nuclear inspectors asked to inspect the Parchin test site, Iranian officials allowed the visit only after they had completely dismantled the test chamber, scraped away several tons of topsoil, cut down nearby trees and covered the entire area with fresh asphalt. Still other documents describe how Project Amad was directed and organized. One chart lists current Iranian President Hassan Rouhani as part of a "Council for Advanced Technologies" that approved the initiative. Other records suggest a supporting role by Iran's Islamic Revolutionary Guard Corps as well as the Quds Force, the elite military unit that the US government describes as a major supporter of international terrorist groups. Documents previously released by Israel including a draft contract putting Iran's military in charge of converting low-enriched uranium to weapons-grade fuel suitable for nuclear bombs. The records further buttress the view - long held by US intelligence agencies - that Iran has kept the intellectual core of its nuclear program intact. Documents describe a series of meetings in late 2003 in which Project Amad's managers discuss ways to keep the program's scientists busy with nuclear-relevant research after the initiative was terminated. Iran's Organization of Defensive Innovation and Research, known by its Farsi acronym SPND, would continue to serve as a platform for research in nuclear-relevant fields, such as neutron generation, and in the training of new scientists, taking care to conceal experiments that might not be easily explained to outsiders, officials say in the documents. "Let there be no mistake: the amount of personnel in the overt and covert parts will not decrease," one Iranian official writes in a memo dated Sept. 3, 2003. "The structure will not become smaller, and every sub-project will supervise both its overt and covert parts." Such declarations are the basis for the Israeli view that Iran never truly abandoned its intention to build nuclear weapons. In a few years, when some of the JCPOA's restrictions expire, Iran will be in a position to resume work on a nuclear device that Israel sees as a threat to its existence, the senior official said. "These documents are old, but they have a bearing on the future," the official said. "It's not a history lesson. They have capabilities they can use in the future." Yet, the question that remains unanswered by the new documents is whether Iran's nuclear weapons ambitions - to the extent Iran still has them - would be better contained by keeping the current nuclear agreement intact. Under the JCPOA, Iran has no pathway in the short term for obtaining the fissile material it would need to build even a single nuclear bomb. While some key limitations on Iran's civilian nuclear energy program will begin to expire in as little as six years, proponents say the pact has permanent provisions that will alert inspectors and spy agencies quickly if Iran begins work on an actual weapon. "What the Israeli documents appear to confirm is that the IAEA - and presumably the intelligence agencies - did in fact have a remarkably good understanding of Iran's program in spite of imperfect access," said James Acton, a nuclear physicist and co-chair of the Nuclear Policy Program at the Carnegie Endowment for International Peace. Despite flaws in the JCPOA, Acton said, the nuclear agreement "represented the least risky option to prevent Iran from acquiring nuclear weapons," with a greater chance of success than any other option. Withdrawing from the pact "could have - in fact, will likely have - the effect of bringing these problems forward by many years," Acton said. But others familiar with the Israeli revelations said they show, at minimum, that Iran has much to account for. The 2015 nuclear agreement did not compel Iran to acknowledge all of its past activity, and some experts think that this shortcoming has allowed Tehran to retain nuclear secrets and a scientific infrastructure that could enable it to acquire weapons quickly in the future, if it chooses to do so. "Why did Iran store such information?" asked Olli Heinonen, a Finnish nuclear expert who led IAEA inspection teams into Iran in the mid-2000s. Heinonen noted that other countries, such as Iraq and Libya, were required by the IAEA to destroy equipment and technical databases related to their past nuclear research. At minimum, he said, the Israeli disclosures should require an amending of the JCPOA so that none of the caps on uranium production are lifted until inspectors verify that all of Iran's weapons research was shut down. "Until the international community has received credible assurances that nuclear-weapons-related work has been terminated - and all single-use, weapons-related capabilities have been dismantled and documentation destroyed in a verifiable manner - Iran should refrain in expanding its uranium enrichment capabilities," Heinonen said.